Kollywood Music Director G.V. 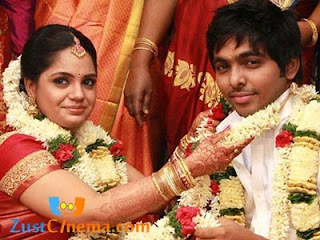 Prakash Kumar has tied to knot to singer Saindhavi on 27th Thursday at 10.25 am. Chettiar Hall and completely in a South Indian Style. It is known that the couple are classmates and it blosomed to love. Kollywood celebrities like Balu Mahendra, Bala Pazhanisaamy, Mani Ratnam, Suhasini Mani Ratnam, K. Bhagyaraj,Suriya,A.L Vijay, Shanthanu, Gayathri and Dhansika are present at wedding ceremony. Newly Wed - Couple will fly to Australia for thier Honeymoon. We wish a Happy Married Life to G.V. Prakash- Saindhavi on this occasion.